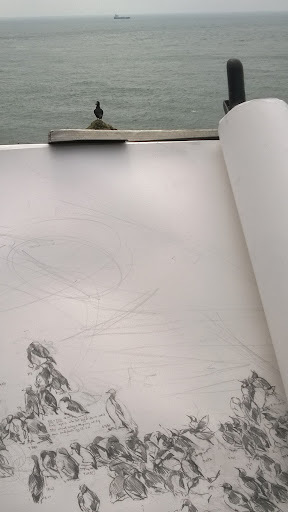 Drawing at the Amos, with a puffin onlooker. I returned to Skomer on the 16th and with calm weather took the opportunity to work at the more exposed South West facing Amos site. 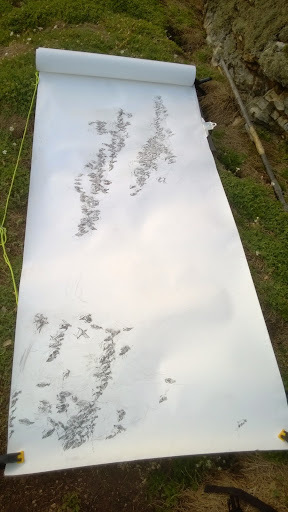 At the moment I am tackling a larger composition on a 3m scroll of the entire study plot that is the main focus of the monitoring programme run here by Tim Birkhead. 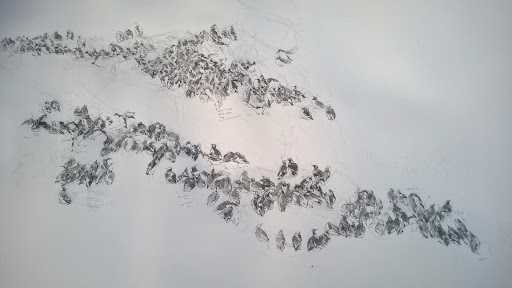 The majority of the Amos's Guillemot pairs have laid during the time I have been away, so there will be lots of colourful eggs in this drawing when finished. The patterning of birds across the loomery is also turning out to be different, not just because the geology of the ledges they use are not like the steep scree of the Bull Hole site I focused on last week, but because their behaviour has changed with many birds taking on a sitting incubating posture. Pairs take it in turns to incubate eggs in 12 hour shifts and there are change over periods at around 5-8am and 4-6pm. During these times, the loomery grows in density as birds return, from foraging perhaps and long greeting, allopreening displays and behaviour occur as guillemots commence in the process of persuading often reluctant partners to leave the egg they have been on for 12 or so hours so they can incubate it. Tension is often high at these periods as returning birds often need to reassert their dominance and claim over both nesting site and partner. Fights are common, often to deal with imposters - guillemot fidelity is not as clear cut as I previously thought. 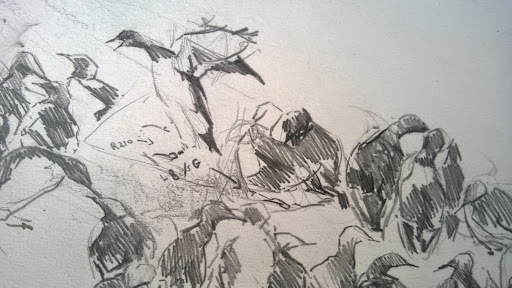 The other focus of this drawing are the guillemots which Tim has ringed with coloured numbered rings which enable researchers to keep track of individual movements, breeding success and even social bonds amongst the loomery. Putting the number on their rings into Tim's database will return a wealth of information about individual lives, I plan to include this information so that single birds can be identified and learnt about. Before evemn looking at the database, the rings have already proofed useful; I am pleased to include in the drawing, two birds which Julie identified as two which had laid early and lost their egg in last week's storm. Today we saw the female return hopefully to lay another egg after the usual four day average period away from the colony feeding at sea. These are the kind of stories that make the whole experience I want to convey so fascinating - only possible because of the dedicated monitoring on this site.